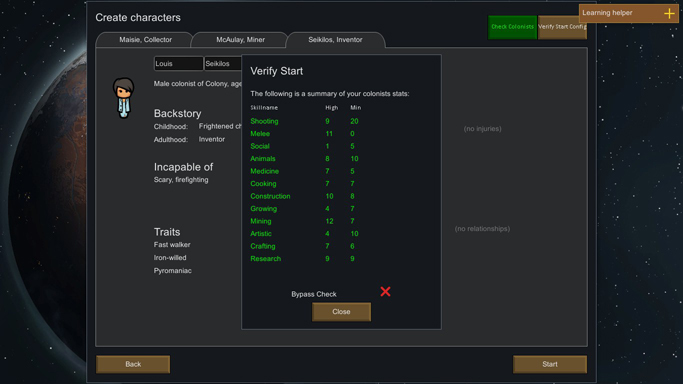 Have you ever rerolled and rerolled and rerolled your colonists again trying to get the perfect combination of construction and crafting and research...only to drop and then find out you forgot to get a good cook? This mod will allow you to set which skills and what the minimum you want at least one of your colonists to have...and if you try to start without any colonists that meet that criteria it will alert you and not let you drop. Be sure to click the Configure Verify Start button to set up the skills you wish to verify and their minimum level from the select colonist screen! Don't worry, it saves the settings between games so you don't have to make changes again unless you want a different skill set to be verified. You can use it in a pack and/or tinker with the source with my blessings. -Fixed issue with skills checks that would return a false passed check to the display screen. This was cosmetic only. -Added check for each skill loaded from config file to see if it exists in the DefDatabase. If not, it loads it, but ignores it. This should fix issues where people have added a mod with a new skilldef, had verifystart run which saves that skill in the config file, then later remove the mod. -Made the warning display screen pretty by making it an even table. -Color coded the warning display screen to show which skills aren't meeting criteria. -Added tooltip to show which pawn has the highest skill on the warning display. -Clicking a skill will jump to the pawn with the highest skill on the warning display. -Added a button to show the warning screen without having to attempt to drop. -Added bypass option to allow you to drop with skills that don't meet your set thresholds. -Added current version number to the about.xml so it will show up in the in game mod screen. -Code refactor in preparation for a compatibility mod for edb's Prepare Carefully mod. -Moved config button from bottom middle to top right of screen in preparation for a compatibility mod for edb's Prepare Carefully mod. -Added Version that is compatible with edb's Prepare Carefully mod. No special requirements. This mod does not depend on any other mods. You can run this and the game core just fine. Either download the zip file and unzip its contents into your mods folder, or if you're using Steam find this mod in the Steam workshop and subscribe. The base mod can be loaded anywhere after the game's core mod. It does not depends on any other mod to function. The version that is compatible with edb's Prepare Carefully must be loaded after Prepare Carefully. Currently not that we are aware of. 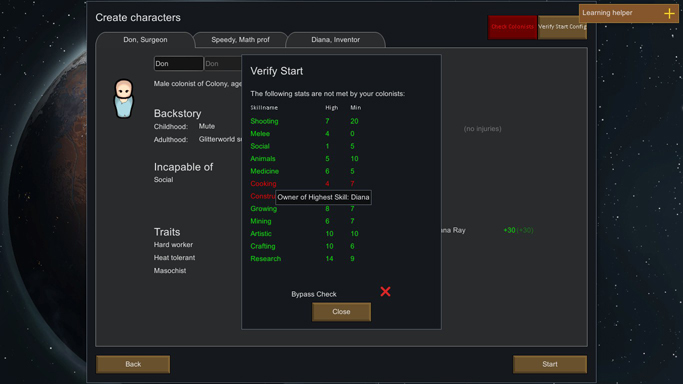 Uh, I guess...but the point of it is to check colonists BEFORE you drop, so it would be pretty useless without starting a new colony. Are there any compatability issues? The base mod is not compatible with edb's Prepare Carefully. Unfortunately with the added complexity of the code in Alpha 16, I do not know if or when I'll get a new compatability mod written. Other mods that use the same method of overriding the base colonist preparation screen will not be compatible with this mod. I found a bug or would like to request a feature. How can I let you know? You can, of course, reply to this thread with that info...but if you want immediate response and would also like to track the status of the issue/feature use the link to the direct download. On the official IPG page you will find the bug and feature request tracker at the bottom of the page. Looks like it will save some tabbing around. I'll try it next game. A couple suggestions. I'd like a way to 'check now' without clicking on start game, and I'd also like a way to start the game even if I don't meet one of the requirements I set, like a 'start anyway' button on the prompt that comes up. Both are on my "To add" list for the mod. Social is the one I tend to forget. At the start I think "I need someone so I can recruit" and then I often start with a bunch of asocials. This looks really cool, and the suggestions made by Adventurer were along the same lines I was thinking. I can't tell you how many times I've forgotten to start with a researcher. "In vertigo you will be..."
Thank you for thinking of another Quality of Life Improvement nobody thought of yet. looks like a solid offering. maybe have it display on mouseover who has the highest skill in that category? I also agree with the other proposed suggestions. I can't take credit for the idea. I've taken to bouncing around from twitch stream to twitch stream of people playing and interacting with the streamers and viewers. 1) it gives me feed back if they are using one of my mods, and 2) I listen to the things they talk about wanting. This one came up on disnof's stream 2 days ago and I thought it was a great idea. Use a table to list what skills didn't meet requirements with two columns 'Highest' and 'Wanted' so it's easier and quicker to see how short you are. Ideally I'd want to see a table of skills and colonists color coded and stuff so you can see which skills didn't meet expectations, what skills everyone has and maybe some stats like totals for each skill or average and maybe total points overall would be interesting. But just formatting what you've got like a table into two columns with spaces would be easier to read I think. A line telling people what Prepare Carefully does with a link. 1 & 2 are not unreasonable requests. I'll look into how easily I can incorporate them (i.e. I'll put it on my to work on list). 1 is probably the easiest to implement, although I've got some under the hood changes that will take some thinking on how to do it right. 3...not exactly sure what you're saying there. Prepare Carefully is another mod's work. Are you suggesting I advertise another person's mod in game in my mod? No not in game, just a little heads up in the description here would be nice I thought. E.g 'My mod let's you reroll more easily but if you want more control Prepare Carefully mod allows you to manually adjust all aspects of a colonist including their skills.' or something. I'd understand if you didn't want to since it's not your work but it would be helpful for anyone who found this first and was looking for finer control rather than just a more streamlined way of re-rolling. Ah, that makes much more sense to me now. I have no problem cross promoting another relevant mod on the forums. Next time I am monkeying around with the base post I'll try to remember to add something about it in there. One other suggestion: An option to allow or disallow inappropriate backstories. So you could choose have colonists with any backstories or only those which are appropriate for the colonist and scenario like you would normally get. And one more: Ability to specify traits to disallow and make it reroll or warn if you get them.